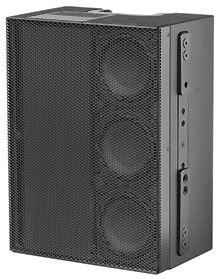 The QM18 is a modular, limited bandwidth loudspeaker to be used as vertical low-mid array, either in stacked or flown configuration, for both permanent and (limited) portable installations. It is designed as low-mid extension of a QR-array. The QM18 “array in-fill” module is applied in a multiple QR-array, where the direct HF reproduction/projection of a QR is not required, but where an uninterrupted LMF line-source array is desirable for extended frequency control. The tightly spaced mid-bass transducers are fully compliant with the laws of line-array behaviour. The Signal Integrity Sensing™ pre-wiring ensures complete cable/connector compensation between the QM18 and ALC. In this way, the ALC can be loaded down to 2 ohms, without any sacrifice on response quality (4 units QM18 parallel on one channel loads 3 ohms). For full system performance, the QM18 needs to be driven by an ALC controller-amplifier. Driven by the ALC, the QM18 delivers maximum sound quality with inaudible (power and excursion) protection (SDP circuit).